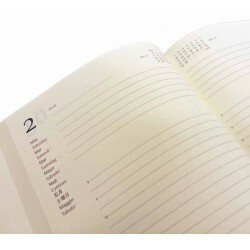 Agenda of the series 2019 with soft cover of genuine leather, stitching on the edges, interchangeable block, available in white with stripes or simply background white without lines. Also available in different colors (red, black, honey and brown) and different sizes, ranging from those typical of the medium size agenda to those of small or large size. veramente molto bella...le foto non rendono la bellezza della morbida pelle al tatto..deòl colore rosso così intenso e naturale.. sono soddisfattissima del mio acquisto...un po' caro ma ne vale davvero la pena !